1. Improved Health. Natural organic fertilizers, soil amendments and pest control products improve soil health and the overall production of plants. They are non toxic to beneficial insects, birds, lizards, frogs, toads, earthworms and other valuable life forms. Pets and humans can be added to the list. Even the manufacturers of the toxic chemicals admit, in fact brag about, the fact that their products kill all the bugs. That’s right – they can’t tell the difference between the good and bad. Only 1-2 percent of insects are troublesome. Even most disease pathogens are beneficial if in their proper proportions. 2. Cost Effectiveness. Any project can be converted from toxics to organics at the same budget. What is more important is that the organic program costs are reduced every year. Each year fewer sprayings for pests are needed, less plant loss is experienced, and plant yields continually increase. And what price do you put on the health of your animals and family? Beds never have to be removed and redone, as is often the case under chemical programs. Under an organic program, the soil gets better and better forever – just as the natural forest and prairie soils do. Organic grass-fed cattle ranches spend little to nothing on fertilizers and pesticides. They rely primarily on natural recycling of organic matter and the natural control of pests and diseases. 3. Time Savings. Because of the healthy soil, irrigation is needed less often, fertilizing is needed less often and replacing diseased and dead plants is needed less often. Doing these things less often saves time compared to the recommended synthetic schedule. Another time convenience is that the timing of the organic applications is not as critical. The season’s first fertilization can go down whenever time and weather allows after the first of the year. The second application whenever time allows late spring to early summer. The third should be done whenever time allows in the late summer through fall. Since the natural organic fertilizers aren’t soluble, they can be broadcast basically anytime. The nutrients become available to the plant roots when the temperature and moisture conditions are right for microbial activity and plant growth. In the meantime, they stay in place and behave themselves. 4. Fewer Sick and Pest Infested Plants. When adapted plants are chosen and planted correctly in the proper environment, they have few pests and require little care. High-nitrogen synthetic salt fertilizers and toxic pesticides are problem creators. They lead to more pest problems because of the destruction of beneficial microbes and insects. Natural organic fertilizers and organic pest control techniques are problem solvers. They concentrate on stimulating life instead of killing it. 5. More Stress Tolerance. Plants growing in soil that is rich in compost, rock minerals and beneficial living organisms have a greater resistance to all stresses – heat, cold, too much water, too little water and unusual weather fluctuations. Trace minerals are an important part of this stress tolerance. They are abundant in an organic program. Organically grown plants will have larger and more efficient root systems. When the proper balance of organic matter, mineral nutrients, air and living organisms are present in the soil, ornamental plants and food crops have greater concentration of complex carbohydrates and these sugars function like natural antifreeze. Trace minerals again are a very important point here. Many organic growers have personally experienced these benefits of the natural way. Anecdotal evidence shows that freeze damage occurs on organically grown plants at a temperature significantly lower than on plants artificially grown. 6. Better Taste and Food Quality. The increased trace minerals and complex sugars in plants improve the taste of food crops. Taste is directly related to the health and nutrition of the plants. So-called experts will argue this point as they will most of our points, but they are wrong. There’s a very easy test. Eat fruits and vegetables grown both ways and see which you like better. Also, the use of toxic poisons eliminates, or should eliminate, the use of many foods and herbs. The best example is the rose. Unless you are spraying poisons and dousing the soil with toxic synthetics, the petals are delicious in salads and teas and the hips, which are the rose fruits, are delicious in teas and an excellent source of natural vitamin C.
7. Improved Environment. Unlike synthetic fertilization, organic programs don’t cause excess nitrogen to volatize into the atmosphere and soluble nutrients to leach through the soil and into the water stream. Natural organic fertilizers stimulate beneficial microorganisms which very effectively clean up contaminations such as pesticides, excess mineral salts and heavy metals in the soil. Leaching is reduced to almost nil and no one has to breathe the fumes or otherwise come in contact with the toxic materials. Carbon dioxide, a problem greenhouse gas related to global warming, is removed out of the atmosphere and converted to an energy form in the soil where it promotes soil life. 8. Recycled Valuable Natural Resources. All once-living materials are rotted through composting and mulching and recycled back into the soil to build humus and trace minerals. 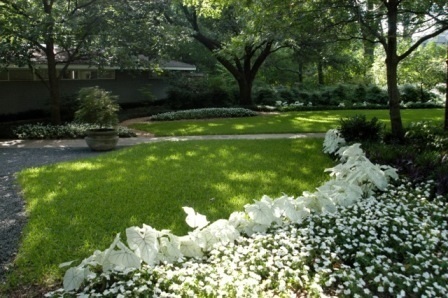 Grass clippings are left on the turf, leaves are left as mulch in beds, tree trimmings are turned into mulch, and animal manures are composted to become important fertilizers. Under the synthetic programs these valuable resources are often taken to landfills, burned or otherwise wasted. 9. Natural Organic Programs are More Fun. It’s really no fun to spill toxic poisons all over you, breathe the fumes, or have to deal with the contaminated clothes, containers and residues. It’s certainly no fun to worry about developing cancer. Under an organic program the ease of application, the great diversity of life that’s experienced and the successful production of plants truly create one of life’s great pleasures. 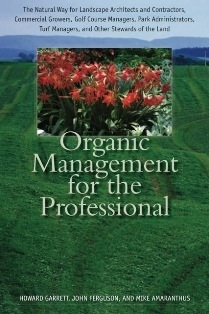 The information for this newsletter is taken from my book Organic Management for the Professional available at your favorite book store. P.S. Check out the daily healthy living and organic tips on Facebook.